Went to lunch at Red Lobster in MN, and had raw Oysters. Inside one of the Oysters I got quite a surprise! The staff did their best to assure me that they were pearls, but it they look like gravel particles to me. The same thing happened to me yesterday at a Red Lobster in Maryland. Hello Anne, I think the employees were correct in saying they are pearls. 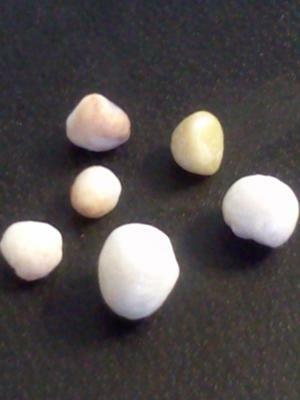 It is normal that they would look like gravel as pearls from edible oysters aren't as lustrous and beautiful as other types of pearls. I think you should do something special with them like put them in a little metal cage and wear them on a necklace...they are great keepsakes!